In November of 2014 support was added for Source IP Affinity (also known as session affinity or client IP affinity) in the Azure Load Balancer. Before that it was not compatible with Remote Desktop Gateway. You could sort of load balance your RDGWs but it required you to put every RDGW server in its own cloud service and the use Azure Traffic Manager to load balance. With this approach you could not put your RDGW servers in the same availability set, so you had no guarantee that your gateways would be distributed across fault and update domains. Boldly, or foolishly, depending on your point of view, I decided to try anyway to use the Azure Load Balancer for RDGW, even though I knew it was not supported. Of course it did not work, but when eventually support was added I ran into problems. 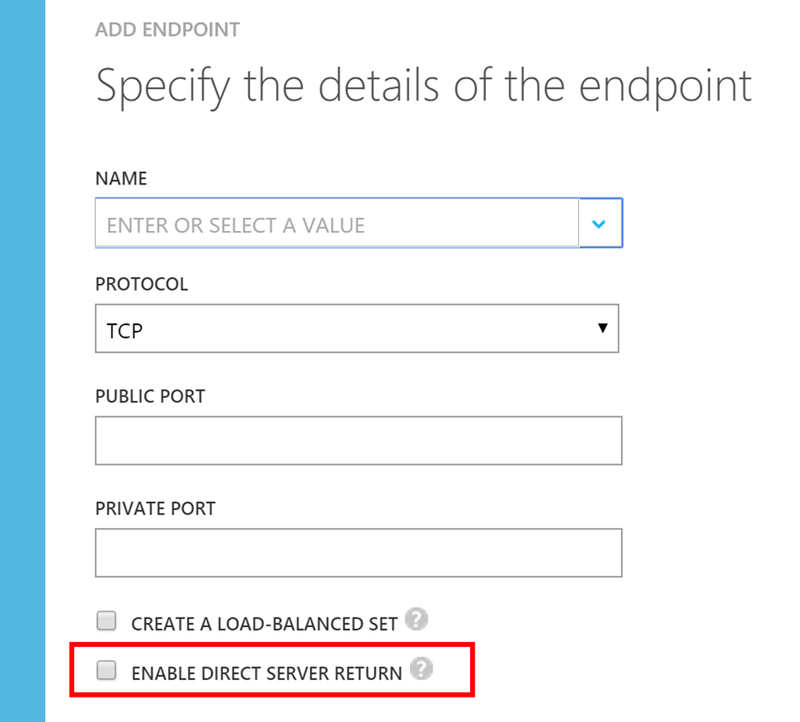 Set-AzureLoadBalancedEndpoint –ServiceName <cloud service name> -LBSetName "RDGW HTTPS" -Protocol tcp –LocalPort 443 -ProbeProtocolTCP -ProbePort 443 -LoadBalancerDistribution "sourceIP"
Set-AzureLoadBalancedEndpoint –ServiceName <cloud service name> -LBSetName "RDGW UDP" -Protocol UDP -LocalPort 3391 –ProbeProtocolTCP -ProbePort 443 -LoadBalancerDistribution "sourceIP"
The sourceIP value in the LoadBalancerDistribution parameter is the critical one and it can only be set through PowerShell. Direct server return configures a virtual machine’s endpoint for the floating IP capability required to configure a SQL AlwaysOn Availability Group. This setting is required when using the SQL Always On Availability Groups in SQL Server. This setting can’t be changed after you create the endpoint. Unfortunately you cannot disable DSR without deleting and recreating your endpoints. After removing and adding them again I was able to connect through the load balancer. Since traffic to a particular instance behind the load balancer now is determined by the source IP, all traffic from the same IP goes to the same instance, you might experience an uneven distribution of load. Clients behind a proxy or NAT router will all end up on the same instance.